I love Turkish delight. I know it’s not to everyone’s taste but I can’t get enough of it. And I like both the traditional stuff and the pieces covered in chocolate. So as an early valentines treat (to myself!) I decided to make chocolate cupcakes with a rose flavoured butter cream. I didn’t have any rose water in the house so I used rose syrup that I found in Makro just before Christmas which worked just as well. Both the cupcake and the icing are Hummingbird Bakery recipes found in the Cake Days book and the small cupcakes and muffins book. Ideal for Valentines day! Leave the cupcakes to cool slightly in the pan before turning onto a wire rack to cool completely. OPTIONAL: Once cooled, I cut out a small piece of cake from each one and added a spoonful of cadbury’s chocolate spread – just to add another depth of chocolateness and goo to the cupcake! OPTIONAL: I also added some pink food colouring. Gel food colourings are much better as they don’t affect the consistency of the mix. If you only have liquid colouring don’t use too much! 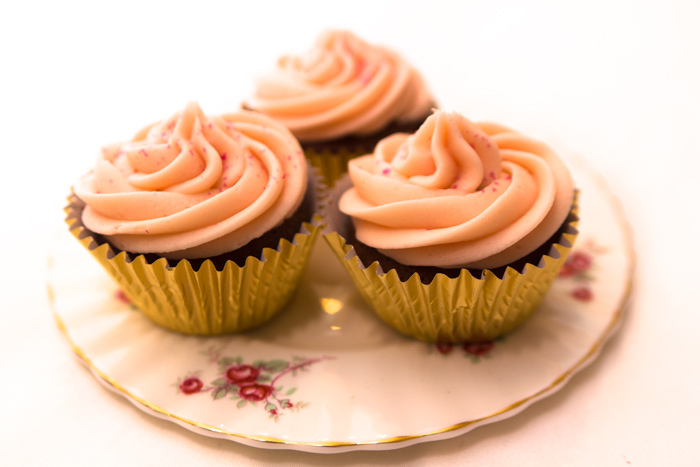 I also topped with pink edible glitter…well, they are for valentines day afterall! These cupcakes went down really well. And surprisingly , it was the men that commented on them the most (I know men love any cake, but these were pink with sparkly bits on them!) so I would definitely say they were a success. As a child, my mum used to get rose water from the chemist. It came in a plain brown glass bottle and she used it with cotton wool to cleanse her face. The smell of rose brings these memories back for me…I would always to try and pinch it for myself! 20ml rose syrup, 60ml grapefruit juice – pour over ice and add tonic water. A lovely refreshing non alcoholic drink. Also good with pineapple juice! And you could even go one step further. Lush Cosmetics have a wonderful spa treatment called The Comforter. An amazing hot chocolate scrub followed by a warm massage with rose scented serum. Pure bliss….you should really try it. I couldn’t stop sniffing my arms after my treatment! I made these in search of a really chocolatey cake but very disappointed. Didn’t taste like chocolate at all! I didn’t get as far as the buttercrean because I binned the lot. Even my kids didn’t like them and that never happens! Hi Sara – thanks for your message. I would probably have to agree that these are not the most chocolatey cupcakes. I think it’s more about the rose flavour in the frosting that makes these cupcakes work.